SOC and IR teams find themselves drowning in constant streams of alerts, logs, and data in managing alerts and escalated incidents. Establishing repeatable process, and layering in automation and orchestration, supported by robust case management is becoming a “must have” for enterprises and MSSPs/MDRs grappling with the increasing attack surface (e.g., cloud, mobile) and sophistication of attacks. Leveraging the SentinelOne EPP and Syncurity IR-Flow SOAR Platform, analysts can leverage the pre-execution, on-execution, and post-execution threat convictions and response actions of SentinelOne with the workflow, automation, orchestration, and case management capabilities of the award-winning, patent-pending, Syncurity IR-Flow SOAR Platform, resulting in a seamless, scalable and dynamic architecture that dramatically reduces the time to detect, validate, contain and remediate threats. The partnership enables joint customers to easily integrate autonomous endpoint protection into existing security architectures. The joint solution empowers enterprise Security Operations Center (SOC) and Incident Response (IR) teams to detect, assess risk and automatically block validated attacks on endpoints from a single view in conjunction with their other tools. 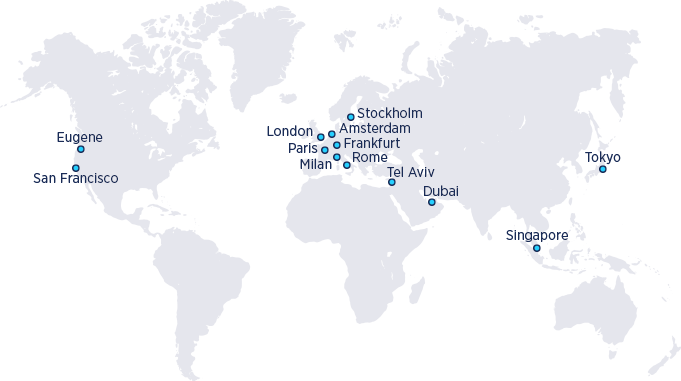 SentinelOne provides more than 200 APIs – the most of any endpoint company – enabling customers to integrate and unify security assets within their environment. 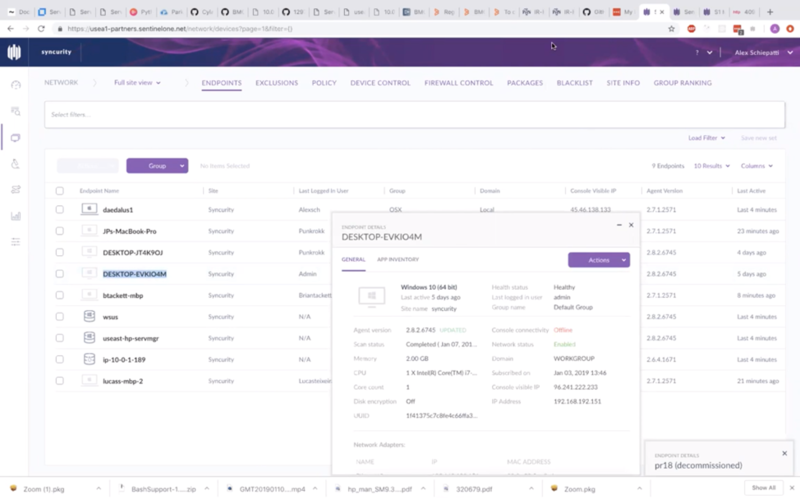 The Syncurity IR-Flow SOAR platform integrates existing security and IT technologies, using repeatable, auditable workflows that provide a dynamic layer of connectivity between them. IR-Flow enables automation for time-consuming and/or repetitive tasks, as well as orchestration across multiple disparate systems and human-required intervention. 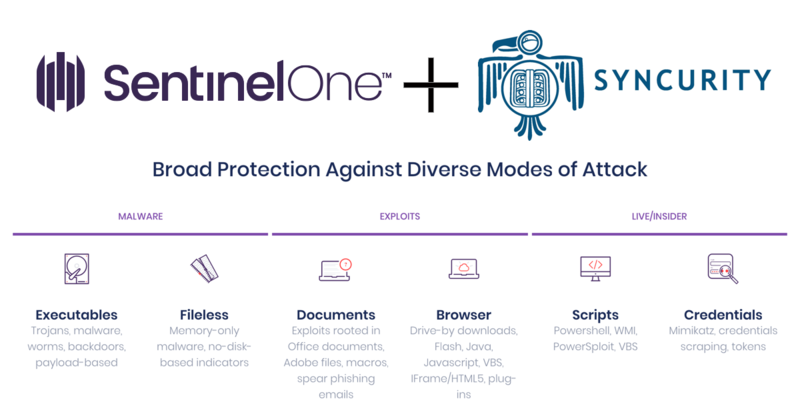 SentinelOne uses artificial intelligence to deliver autonomous endpoint protection and automatically eliminates threats in real time. The joint solution helps customers dramatically reduce the security risk lifecycle to identify, validate and stop damaging cyber attacks. In addition to the robust number of APIs, the SentinelOne Syncurity IR-Flow integration provides support for more than ten proactive actions that empower security teams to better protect their environments. These actions are uniquely independent of the applications calling them, and support alert ingest, data enrichment and risk containment/remediation actions, and enable Analysts to dynamically run endpoint scans, blocking hashes, and quarantining endpoints.